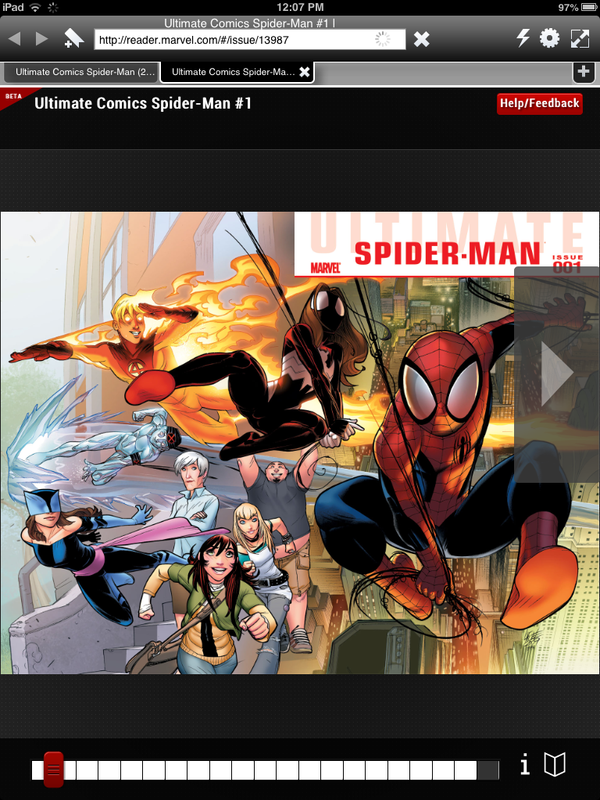 You are here: Home / Marvel Unlimited / MDCU on iPad is Getting Better! How’s the Flashless Beta Reader Looking? As most loyal MDCU readers know by now, after years of fruitless flashless iPad failure, Marvel Digital Comics Unlimited has recently released their new Beta Reader. The new reader makes digital subscriptions easily accessible on iPad or iPhone, but as with any Beta product, there are some kinks. After around two weeks with the MDCU reader, how does the future of digital comic reading look? Update 3-12-13: Marvel has recently announced their free Marvel Digital Unlimited app for iPhone and iPad. 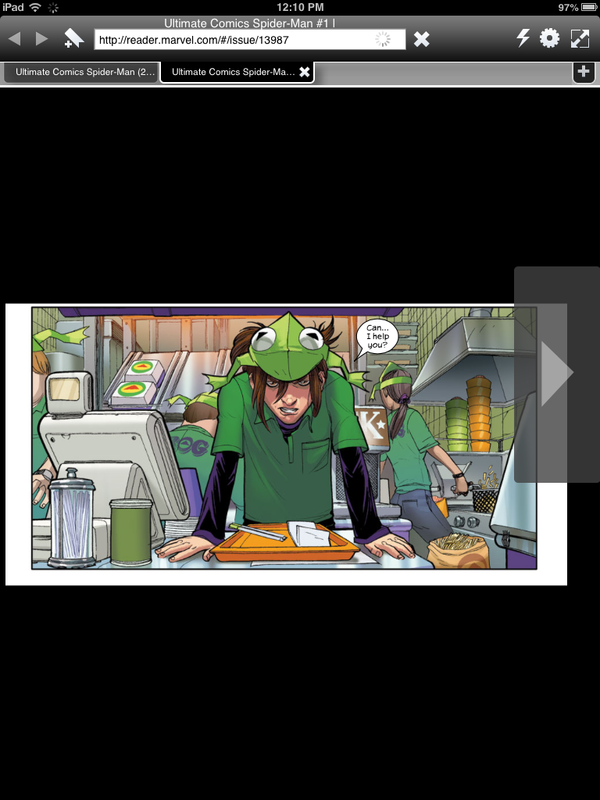 The app uses its own technology for comic reading, but it looks and feels exactly like the beta reader. It seems clear at this point that Marvel simply prefers the design and functionality of the new beta reader, which is all laid out in detail below. END UPDATE! For the most part, the new MDCU reader is looking very promising. After a very rocky start to the reader, with a borderline impossible method of flipping from panel to panel, the reader has reached a nice state of working functionality. Lack of iPad/iPhone accessibility has been one of very few downsides to Marvel Digital Comics Unlimited, so it’s pretty exciting to see Marvel really reach out for the needs of the fans here. One imagines they did so with open hearts and joyous grace. And what you’re seeing above is a sample, smart-panel view of the new MDCU reader. That big arrow on the right hand side of the iPad. Just tap that puppy (but do it with a less gross sounding expression) and you’re on your way to the next panel. No more, Flash! Uh.. Adobe-style. Thompson seems fine. As you can see, it’s a pretty nice-looking reader when it’s working. For those familiar with comixology, you know just how fantastic looking a comic is on an iPad, and the tap-to-change-panels experience here is equally simple. 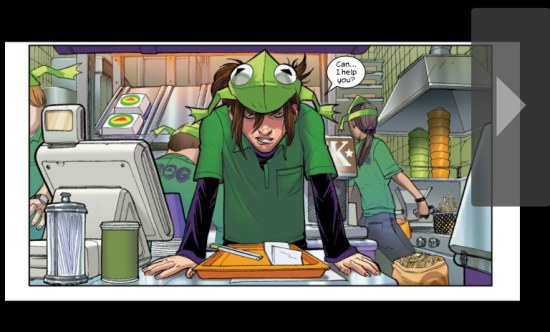 The only real issue I have with the reader right now is simply losing balloons and panels in Smart-Panel mode. It’s one thing to just have to slide your finger and see a few more centimeters of a panel, but it’s another thing entirely to see random balloons in the black void of your iPad. This is fairly common with many issues right now. I read three issues of the Ultimate Spider-Man comeback this weekend (post-Ultimatum. Guys… what happened to the art?) and Dark Avengers #141 (a Siege prelude, and oddly enough the #1 ‘Most Read’ comic on MDCU). USM had limited issues (see above) and Dark Avengers #141 was unreadable because of incorrect panel transitions and misplaced dialogue. Again, though, this is still early Beta we’re talking about. Being overly critical of the reader would be like watching one of those “Louis CK before he was famous!” videos and telling all your friends he’s an overrated hack. Right now, three weeks into a world of MDCU on iPads, the new reader is well on its way to becoming the answer to all our previously unheard, Flash-driven prayers. No more extra steps involving my iPad flash-workaround once this thing is finalized. It’s not the reader we need; it’s the reader we deserve. How Do I Get the MDCU Beta Reader? Changing to the new MDCU reader. It’s a quick click and your reader settings will change. Pretty easy. I’ll be keeping an eye on any Beta reader developments and updating the blog as changes occur. Have any reader related questions still bugging you? Let me hear about it in the comments and I’ll see what I can do to help. Thanks for stopping by! I’m not an MDCU subscriber but I would start an account if I could access the comics database via my iPad. Can current non-subscribers install the beta app and join? This is a good question. Unfortunately, the beta reader isn’t a separate app, but instead comes as part of your Marvel account. I just checked on a dummy account w/o a subscription, and you can not view the Beta Reader option in your account info prior to subscribing. 2) Wait until the Beta becomes the standard. Lame answer, I know, but if you’re really set on iPad only reading, this’ll make sure that’s a possibility. And hopefully by that point, it’ll be more of a pleasure to read from your iPad anyway. I wrote another post about what do when the comic is too small. I recommend checking it out, I think it should help. I’ve had a similar (although not exact) problem when using Safari. 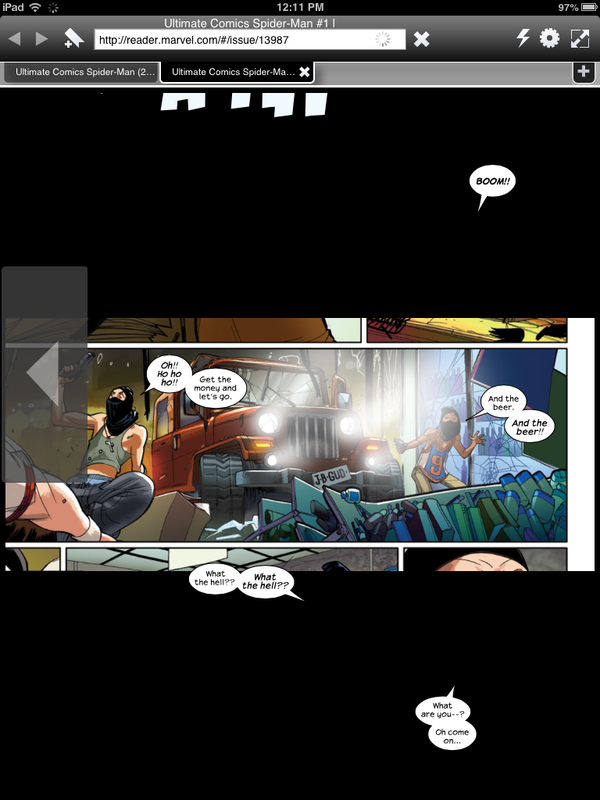 Tonight, for example, when I try to read comics using Safari, the comic automatically redirects to the details page. Not quite blacking out and closing everything, but annoying. Weirdly, on the exact same iPad, I’m able to use the Beta reader fine using Photon as my browser. I can’t explain this. I’m thinking it has something to do with bandwidth and Marvel’s servers, which are impossibly slow tonight. I’d be a little surprised if the problem was your HD, although it’s possible. The iPad I’m using has a lot of space available. How is your browsing of other sites? If the speed is pretty much fine, then it’s probably an issue on Marvel’s end. So, basically, aside from browsing through Photon (or another similar 3rd party app), the reader is busted for me too. Hoping this is a temporary kink as they work out the bugs, but I’m going to keep checking.